The GroupShot universal app for iPhone and iPad allows you to blend faces from similar photos for a seamless, high-quality photo where everyone looks great. Taking good group photos with friends, family, co-workers, while bar hopping, playing sports, visiting the Lincoln Memorial, or at any other place else can be impossible and frustrating. Here’s what you end up with normally; Someone has closed or droopy eyes, someone else has a turned head. And, if you post a lousy picture of a friend on Facebook, you’ll hear about it. The Group Shot app is incredibly well-designed, highly functional, and intuitive. When you open the app for the first time, you can choose to watch a video to acquaint you with GroupShot’s interface. This is a great video. It is clear, concise, pleasant, and thorough. At the end of the video, you have the opportunity to play with built-in photos. Wow, you will be shocked by the juxtaposition of the incredibly complex capacity of Group Shot and its easy, responsive touch controls. You choose several group photos from your iPhone and iPad libraries, or you shoot photos from the GroupShot iPhone app camera. You will find the main photo in a larger part of the screen with the similar photos in a scroll feature on the right side of the screen. You simply rub your finger across the face that looks lousy. You don’t have to be terribly precise, but generally keeping on the face. You then scroll through the similar photos to choose the person’s face that better suits your main photo. After you select the photo, the processing begins. You know it’s processing when it says, “Performing magic.” Your nicely blended, corrected photo is complete. You touch select, and you’re finished. If you want to make more adjustments, compare photos, and undo your work, you simply touch the icons in a bar at the top of the screen. The response time is quick, and the features are easy to understand and apply to your photo. The sharing features are accessed via the bar at the top of the screen as well. You will appreciate not jumping through windows and hoops to share your image. You can save and email, as well as post to a Facebook timeline or share via Twitter. I would recommend incorporating popular blogging websites to improve and enhance functionality. You will be sad you have missed so many minutes of your life trying to get people together, smiling, and looking in the same direction. The GroupShot universal iOS app is a must-have for everyone and delivers incredible functionality for only $0.99 which is a steal. 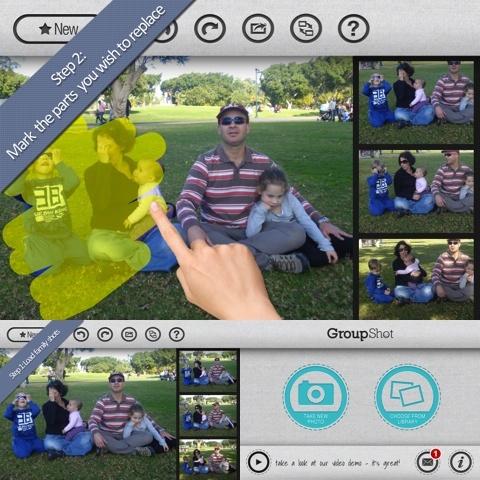 AppSafari review of GroupShot was written by Jenni Ward on February 8th, 2012 and categorized under App Store, Featured, iPad apps, Photos, Universal, Utilities. Page viewed 6009 times, 2 so far today. Need help on using these apps? Please read the Help Page.